Samuel McGhee PICTURED: Decagon Devices founder Gaylon Campbell, center, with members of his family. Renowned Washington State University soil scientist Gaylon Campbell worked part time to blend an engineering background with customer needs and create an instrument that measures water potential. Decagon Devices, soon to be Meter Group Inc., makes instruments to test plant-available water in the soil. They are used in environmental monitoring and research. The company also manufactures water activity meters for food manufacturing and safety. Since its founding 30 year ago, the company has averaged 12 percent revenue growth each year. 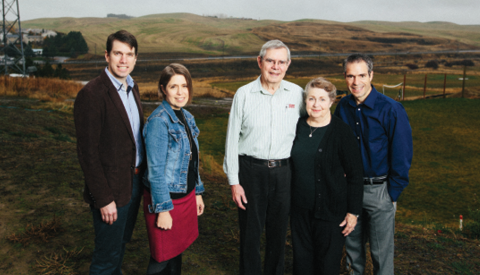 Four of nine next-generation Campbells are among Decagon’s 170 employees, including Scott Campbell, the president; Tamsin Jolley, board treasurer; Colin Campbell, a soil scientist and vice president of core markets, and Julia Mumford, a marketing manager. Grandchildren work in a new internship program that Gaylon Campbell says will help them “connect to the mission of our business in a fundamental way.” Campbell says the company has improved corporate governance and avoided duplication by focusing the executive team on managing the firm day to day while having the board of directors oversee long-term strategy. Decagon has sold water-activity meters to such companies as Kraft and Nestlé but expects growth to come from providing quality-assurance labs with full digital systems to replace written records for safety inspections. Judges were impressed with Nakanishi’s thoughtful operation of a family-owned dental appliance business that employs 60 people. Nakanishi relies on an outside executive coach to help navigate decisions and mitigate issues that might interfere with the business. When there are potential conflicts, preserving family relationships always get first priority. Grandfather Ray Nakanishi, a talented dental technician, started the business in 1953. He was followed by his son, David, who added technical strength and management expertise. Now, the next generation is layering in customer service and digital-age manufacturing perspectives. Together, those capabilities resulted in record-breaking sales in 2015. For 48 years, State Roofing has addressed client needs by applying vast experience to the installation of quality roofing, windows, siding and decking that requires little maintenance and is tough against the Pacific Northwest climate. Founder Cole Smith started in 1968. State Roofing has since installed more than 50,000 projects. Nephews Lance and Brad Smith, who started working on roofs, bought the assets and built the business into one of Washington’s largest roofing firms, with 60 employees. Multiple family members work in the operation: Brother Marty runs the mechanic shop while Nancy, Lance’s wife, is CFO. In the next generation are Michelle, working in finance, and Kevin, who is general manager.